Electorally, 2018 has turned out to be the Bharatiya Janata Party (BJP)’s annus horribilis, comparable only to 2015. In 2018, the BJP’s rare successes in north-east India aside, everything that could go wrong, did go wrong for the Amit Shah-led party. After its successes in the Lok Sabha and Assembly polls in 2014, the BJP had lost both the Assembly polls that took place in 2015, in Delhi in February and Bihar in November. The defeats forced the Narendra Modi government to replace its reforms pitch with “garibkalyan”, or welfare of the poor. Now, 2018 has ended with a reminder to the party that Modi government’s garibkalyan has failed to overcome the twin impacts of demonetisation and the Goods and Services Tax, particularly on the rural economy. The recently concluded Assembly polls also mark the resurgence of the Congress in the Hindi heartland and shatter Shah’s dream of a ‘Congress mukt’ India. The Congress now has governments in Rajasthan, Chhattisgarh and Madhya Pradesh, in the latter two states for the first time since 2003. In 2014, BJP had swept these three states, winning 62 of their 65 Lok Sabha seats. In contrast to 2018, nothing could go wrong for the BJP in 2017. That year, the BJP scored famous wins in Uttar Pradesh (UP) and Uttarakhand, and formed governments even where it failed to emerge as the single largest party, in Manipur and Goa. Then there was Bihar, where the BJP had lost in 2015, but formed the government midway into 2017. The march of saffron looked inexorable. Then on February 1, the Election Commission announced results of Ajmer and Alwar Lok Sabha by-polls in Rajasthan. Its scale of defeat astounded the BJP. The disappointment was short-lived. On March 3, the BJP ended the Left Front’s 25-year rule in Tripura. It also succeeded in becoming a junior partner in coalition governments in Meghalaya and Nagaland. Another jolt awaited the party less than a fortnight later when it lost the Lok Sabha by-polls in Gorakhpur and Phulpur. This was exactly 12 months after its famous Assembly win in UP, that too on seats vacated by its current UP chief minister and his deputy. A couple of months later it also lost in UP’s Kairana. The PM campaigned aggressively for the Karnataka Assembly polls. The BJP emerged the single largest party. Having learnt its lessons from Goa and Manipur, the Congress moved swiftly to offer the Janata Dal (Secular) the chief ministerial post. With Lok Sabha elections less than four months away, the electoral reverses of 2018, particularly in the Hindi heartland that had propelled BJP to form the first majority government in 30 years in 2014, has the party worried. 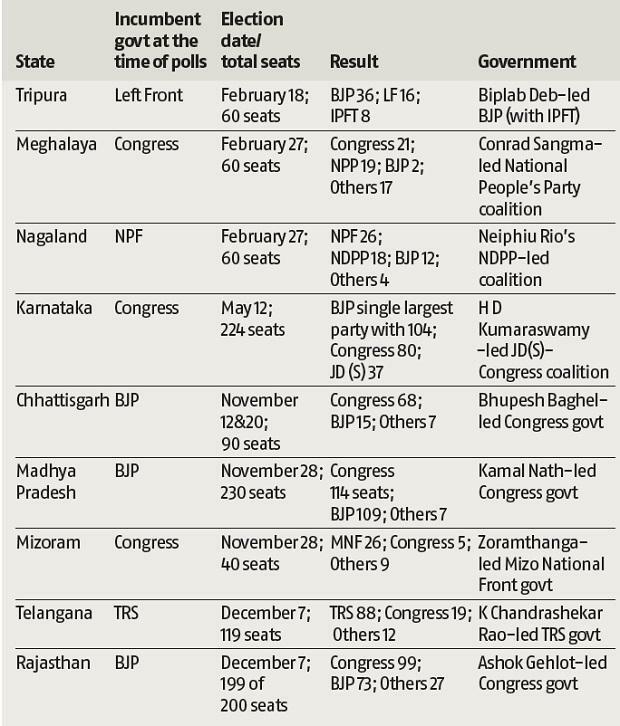 Party strategists hope to make up for the losses in the Hindi heartland by potential gains in West Bengal, Odisha, the north-east and Telangana in 2019. They believe the Modi magic, in the absence of any credible leader in the Opposition, could help it to return to power.